February 17, 2017, Maputo, Mozambique: As Tropical Cyclone Dineo battered the coastline of Mozambique in February 2017, the potential effects of increasingly frequent and severe storms were very apparent. To assist the country to adapt to climate change, the Mozambique Ministry of Land, Environment and Rural Development (MITADER) was supported by UNDP to conduct a three-day training, connecting stakeholders from across the nation, with the aim to build a roadmap for a National Adaptation Plan. The training was supported by the joint United Nations Development Programme–UN Environment National Adaptation Plan Global Support Programme (NAP-GSP), in collaboration with UNDP Mozambique, through the Sustainable Management of Natural Resources For Resilient and Equitable Growth and Development Project (SUNRED), with additional financing from GiZ. The National Director of Environment (MITADER), Ivete Maibaze, officially opened the event. While all event attendees arrived safely, the workshop coincided with the landfall of Cyclone Dineo. As it swept across the Mozambique Coastline, displacing some 130,000 people and killing at least seven people, the devastating effects underscored the urgency of planning for climate change. Mozambique is highly vulnerable to the effects of climate change, and the process to build an effective National Adaptation Plan will be essential in building resilience to the regular tropical cyclones, droughts, floods and other extreme weather events that impede progress toward achieving the Sustainable Development Goals and providing a brighter future for the people of Mozambique. In all, 28 participants from Inter-Institutional Group for Climate Change (GIIMC) took part in the training, facilitated by Inês de Sousa Mourão, an environmental engineer and leading expert on low-carbon resilient development. These participants represent important social and economic sectors from across the nation, including agriculture, economy and finance, forestry, water resources, meteorology, environment, energy and disaster management. Mozambique's National Strategy for Adaptation and Mitigation to Climate Change (2013-2025) focuses on local adaptation plans, land-use planning, raising public awareness, establishing a climate change knowledge center and developing climate change indicators for a monitoring and evaluation framework. The training is part of Mozambique's National Adaptation Planning process. This process was officially launched by the Government of Mozambique in December 2016, as a part of the nation's preparation to update its Nationally Determined Contribution. The roadmap builds on Mozambique's adaptation efforts, which among other things, will work to strengthen early warning systems, build capacity for agricultural producers to cope with climate change, reduce the impacts of climate change on coastal zones, and improve management of water resources. Learn more about ongoing initiatives. 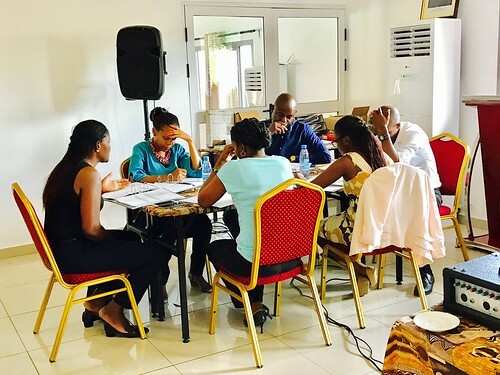 During the training, groups discussed Strengths, Weaknesses, Opportunities and Threats for adaptation planning, prioritized adaptation options, and connected with counterparts from across the nation's economic and social sectors to build a roadmap for Mozambique's National Adaptation Plan. The draft National Adaptation Plan roadmap prepared during the conference will be validated in upcoming weeks.